Theresa May has promised a "multi-year" funding plan for the NHS in England to address its long-terms financial needs. The PM said she wanted to get away from annual "cash top-ups" and would come up with a blueprint later this year to allow the NHS "to plan for the future". She said she hoped to build a political consensus on improving productivity and efficiency and reducing cost pressures. Labour said it welcomed any promise of extra funding from a government which had "starved" the NHS of resources. Simon Stevens, chief executive of NHS England, said the health service needed to capitalise on advances in medical care while ensuring the "great pressure" on front-line staff was alleviated. Following one of the toughest winters in recent years, more than 100 MPs have urged the PM to set up a cross-party Parliamentary Commission to address the health service's long-term financial needs. On Sunday, Health and Social Care Secretary Jeremy Hunt called for a 10-year funding deal, arguing this would allow proper planning to train the staff needed to cope with the challenges of an ageing population. This is a radical move by the prime minister. Committing to a long-term NHS funding plan this year ahead of the spending review for other departments in 2019 is a break with tradition. What's more, it will provide the NHS in England with a budget over a longer timeframe than the three years for other Whitehall departments. But trying to assess what the NHS will need in the face of demographic pressures will be a tough assignment. How it will be paid for is another tricky question. Staff and patients will withhold judgement till the detail is published. Mrs May has raised expectations. Now she has to ensure her plan doesn't disappoint. Appearing before the Commons Liaison Committee, Mrs May said she wanted to come up with a different approach to funding the NHS and social care in the run-up to next year's government Spending Review. She said she wanted a dialogue with clinicians and NHS workers, as well as MPs, to discuss the best way forward, based on the health service's existing five-year forward view, launched in October 2014. She said that while the NHS had received an extra £10bn since 2016, yearly cash injections, often in response to acute pressures, were no longer the answer. "We need to get away from this annual approach we see to the NHS budget," she told MPs on the committee. "We have to recognise for the NHS to plan and manage effectively, we need to get away from the annual top-ups to the budget we have seen. We do need to have a sustainable long-term plan." Asked by Labour MP Meg Hillier if the NHS would have more money to spend each year, taking into account required efficiency savings, Mrs May said everyone wanted a "properly resourced" health service. "By definition we have already committed to putting more money into the NHS over the coming years," she said. "So, more money will be going into the NHS." Following his recent Spring Statement, Chancellor Philip Hammond hinted at "headroom" for further money for the health service while last week ministers and union leaders agreed a pay rise for 1.3 million NHS staff, averaging 6.5% over three years. Conservative MP Sarah Wollaston, chairwoman of both the Liaison and Health select committees, said it would be a huge challenge to review NHS, social care and public health budgets all at once. "The big questions will be how much funding, how will it be phased and when will it come on?" she said. 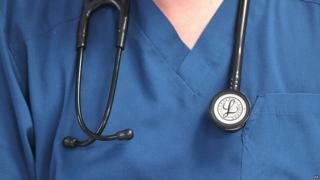 Labour said the health service was "in crisis" and needed an extra £5bn this year. "I am sceptical because the government has refused to give the NHS the funding it needs over eight years." said shadow health secretary Jon Ashworth. Mrs May would not comment on press reports over the weekend that ministers were looking at a dedicated health tax backed by some Conservative MPs - an idea the BBC understands has been discussed at cabinet. NHS pay: What about the rest of the public sector?